Pixar hops onto the often lucrative sequel train once again for Finding Dory, a long delayed follow-up to their hugely successful 2003 film Finding Nemo. Director and co-writer Andrew Stanton is back with a story that closely follows the narrative beats that worked for its predecessor but also touches on some darker and more mature themes that are a welcome departure from the frivolous tone of most animated adventures. It’s disappointing, then, that the movie jettisons most of these concepts in the final act for a more juvenile and inconsequential approach that comes off as goofy rather than grounded. It’s one year after the events of Nemo and we are re-introduced to amnesiac blue fish Dory (Ellen DeGeneres) as she begins to have foggy flashbacks of her childhood and her long lost parents. She becomes determined to find them and her quest leads her to a coastal California aquarium, where she befriends the lovably gruff seven-legged octopus Hank (Ed O’Neill) and re-unites with her whale shark childhood friend Destiny (Kaitlin Olson). With the help of many other supporting characters, Dory traverses the obstacles of the frequently perilous Marine Life Institute in hopes of reuniting with her family. One of the noticeable improvements on the original is the impeccable visual design that serves as a reminder for how quickly technology is advancing in the realm of animated filmmaking. If you had asked me 5 years ago what the best looking Pixar movie was, I probably would have said Finding Nemo but the level of photorealism that the studio has reached in their most recent efforts is nothing short of remarkable. Beyond just being aesthetically pleasing, the definition and the vibrancy behind these characters and settings also allows for some fun visual gags too, as when Hank uses his camouflage capabilities to seamlessly blend into his surroundings. For all of the intelligence that went behind the look of this movie, it seems that there were other elements that were dumbed down in order to compensate. The premise essentially boils down to one primary motivation and while the contrivances that arise are sometimes clever and inventive, they eventually undermine basic principles of logic and physics that seem far-fetched for any animated film, much less one from Pixar. The overblown climax, which involves a car chase in which an octopus successfully drives a car on a highway, may be silly enough to work for smaller children but left cynical little adult me straining not to roll his eyes. There are smaller scale setpieces that tend to fare much better, like Dory and Hank’s terrifying trip to a touch pool where children’s hands dart in from the water’s surface like jagged bolts of lightning. Even the quieter moments in Dory’s flashbacks, in which she struggles to recapture memories from her fragmented childhood, build to something even more poignant than the emotional center of Nemo. 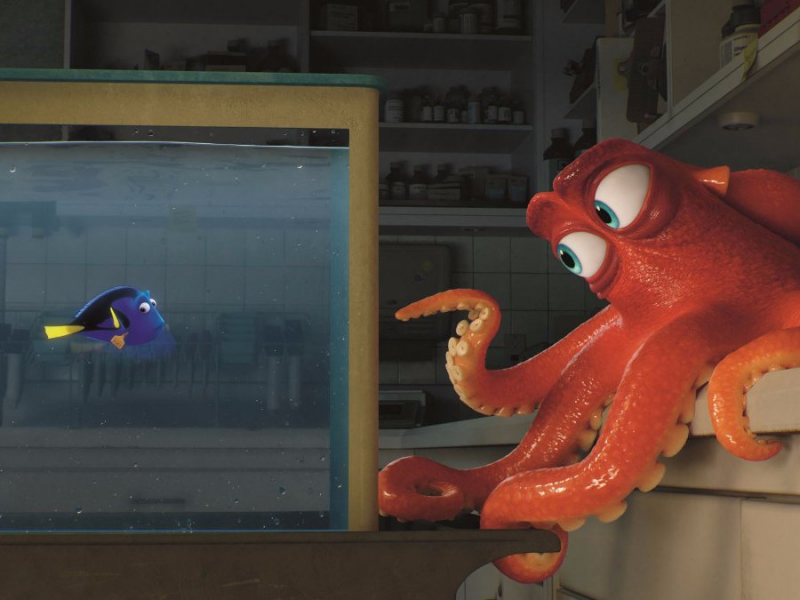 If Finding Dory had stuck to more sophisticated storytelling instead of panders to its younger audience, there’s no doubt that it would have been a more worthy and likely superior successor.